This entry was posted in Aspergers syndrome, Aspie rights movement, Aspies, autism, autism spectrum disorders, bullying, essays, mental retardation, neurotypicals, positive aspects of Aspergers, psychology and tagged Aspergers syndrome, Aspie rights movement, Aspies, autism, autism spectrum disorders, bullying, Diagnostic and Statistical Manual of Mental Disorders, Internet, LGBT, mental retardation, neurotypicals, positive aspects of Aspergers, psychology by luckyotter. Bookmark the permalink. Gale’s article was amazing, and cleared up a lot of misunderstandings people have about Aspergers. We need to get the word out there that we are a variation of normal! And you are well on the way sugar. 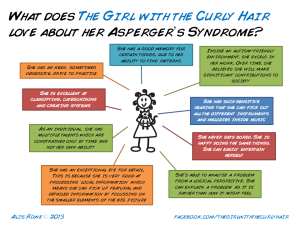 I have friends who has aspergers too, and one of those only was diagnosed in her adult life. Until then she was told she had mental illness, she was mad, she was strange etc. Now its a name for her illness, it still does not make it any better, but she knows what it is now at least. Well done again both of you. It was such a relief to be able to give myself a label as an adult. People hate labels, but having a label FINALLY made it clear what was wrong with me–for most of my life, no one could figure out what my “problem” was. Although I have suffered from (or still suffer from) other mental disorders (major depression, severe anxiety, PTSD, and was diagnosed at different times as having both Borderline Personality Disorder and Avoidant Personality Disorder) , none of those things explained my odd and obsessive ways of thinking and communicating and my dislike of the neurotypical world. Aspie kids daydream a lot–that’s how we cope. The adults do too. My MN mother hated it when I went into my “spooky” moods–my Aspie trances–because it was at those times she knew she could not get to me and that made her so mad! I first self-diagnosed when I read a book about Aspergers and felt like it was written about me! This was later confirmed by a psychiatrist. Kids today are so much more fortunate to be diagnosed early and don’t have to deal with the mystery of their “problem” and can learn Aspie-oriented behavioral methods to help them develop better social skills. The anti-bullying movement is also a very good thing. Back in my days as a kid, if we got bullied it was our fault for not “fighting back.” People my age with Aspergers didn’t have the advantages the younger generation does in understanding their disorder. I quite agree with you on this Otter. My friend who recently was diagnosed was bullied too, and still today to a certain extent is bullied. 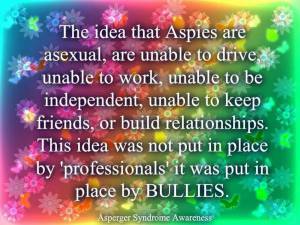 Although more knowledge about being Aspie makes it easier for us as friends to know how to handle her bullies. She feels now that she knows what is actually wrong with her, she can ask for help. She tells her friends what she needs to say or do, and we try to help her. And to a certain extent protect her from bullies. Not ideal i know, but at least she now knows what is wrong with her, and she will ask for help. Its people like you who have helped to bring this out into the open. I think you sugar. Very much.